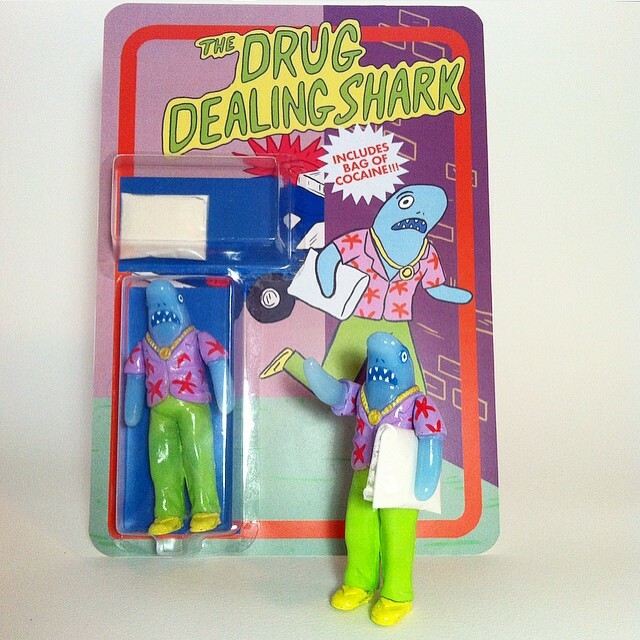 Following the success of his recent “Trash Wizard” release, illustrator Joseph Harmon has wasted no time in getting to work on his latest resin action figure… the awesome Drug Dealing Shark! Standing at around 3.75” tall and coming with 2 points of articulation, the originally sculpted piece has been produced in a light blue resin for this first outing, coming complete with Harmon’s signature mix of contrasting neon and pastel brushwork. Limited to an edition of 25 figures – each coming blister mounted on a card backer alongside a bag of nose candy(!) – the Drug Dealing Sharks will be touching down in the artist’s store at some point this Friday, May 15th for just $65 shipped in the US. Can’t wait until tomorrow? Then you’ll be glad to know that Harmon is currently accepting preorders via e-mail- hit him up directly at mrjosephharmon@yahoo.com with your enquiries! This entry was posted on May 14, 2015 by trutek. It was filed under action figures, resin and was tagged with 3.75", action figures, drug dealing shark, joseph harmon, resin action figures, resin art toys.